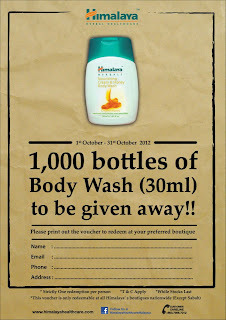 This promotion of a free bottle of Himalaya body wash (30ml) is valid from 1st – 31st Oct, 2012. This is only available at all Himalaya boutiques except for Sabah. Poor them. There are a total of 1,000 bottles to be given away nationwide. I am hopeful that it’s that amount per boutique but fat chance! This entry was posted in Samples and tagged body wash sample, Himalaya, Himalaya samples, Malaysia on October 12, 2012 by Cyberpartygal.